To measure for the width and length of your curtains please use the diagrams and tips below. WIDTH: Measure from one end of the track to the other. 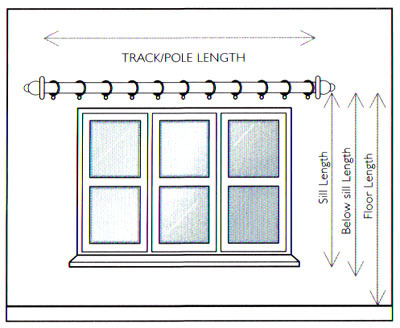 LENGTH: Measure the length from the top of the track to the point where you want your curtains to finish. WIDTH: Measure the length of the pole visible between the 2 finials (pole ends). LENGTH: Measure from the bottom of the ring. This will ensure that the pole remains visible once the curtains are hung. Use this simple guide to help you decide on the finish drop of your curtains. You will need to measure from the very top of your pole to ensure the correct drop. You will need to measure from the top of your pole. Please add 3cm to your measurements. Your curtains are made slightly longer as eyelet curtains are intended to sit above the pole. First of all you must choose whether to have your blind fitted either inside or on the outside of the recess. Please check the width at both the top and bottom of the window, as they might be different. Order the smallest recess width size to ensure the blind does not catch when fully extended. Please deduct 1cm from your inside recess measurement to ensure the blind fits comfortably. Please add 10cm to the largest recess width measurement. This ensures the window is covered by the blind and minimises the amount of light that filters into the room. All blinds are supplied with a light coloured wooden acorn. Measure the length of the valance track and the length of both returns. We need the total of all these measurements. Measure the length of the track and the length of both returns. If the curtain is to sit behind the pelmet board we would recommend that the curtain is hung below the track. The curtain length measurement is taken from the eye drop of the curtain track runner. All measurements and selections must be double checked prior to placing the order.